Metra Speaker Harness: Metra speaker harnesses prevent you from having to cut your vehicle's factory speaker plugs when replacing your factory speakers with aftermarket car speakers. The Metra speaker harness features two female quick-slide connectors on one end to attach directly to your new aftermarket car speakers & a proprietary Molex connector on the other end that connects to your vehicle's factory speaker plug. Quick-Slide Connectors: The Metra speaker harness is equipped with a large (positive) & small (negative) female quick-slide terminal. These quick-slide terminals fit directly onto most aftermarket car stereo speaker terminals (slight crimping may be required). In rare cases that the quick-slide terminals do not fit your car speaker terminals, you will need to solder the Metra speaker harness to your aftermarket speaker's terminals or replace the quick-slide connectors on the Metra speaker harness with the correct size terminal. Wire Code Chart: Two identical Metra speaker harnesses are included. 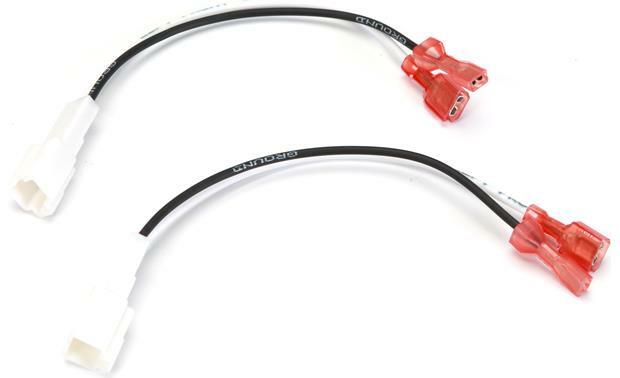 Searches related to the Metra 72-7901 Speaker Wiring Harness For select 1988-2006 Mazda vehicles.